NEWS – Year round, my husband wants a big fan running in our bedroom at night. In the summer, I don’t mind it so much, because it helps keep the room cooler. In the colder months, I don’t want it running because it can make the room too chilly for me. My husband needs it for the white noise, though, because every little sound can bother him. If he had a pair of these Noise-Masking Sleepbuds from Bose, he wouldn’t hear the ambient sounds that bother him, and I could sleep without freezing. With the app, you’ll choose a uniquely-engineered sound to mask unwanted noise – traffic, talking, snoring – and lull you to sleep. And don’t worry that the noise-masking will prevent you from hearing your alarm, because the app has an alarm function built in to wake you without disturbing your bedmate. If needed, you can adjust the volume of the masking sounds, so you won’t be completely shut off from sounds you need to hear, such as a crying child. Of course, you won’t sleep if you are uncomfortable, so Bose did 3-D scans of scores of ears to help them design small, comfortable sleepbuds The sleepbuds measure 0.94″ high x 1.06″ wide x 0.56″ deep and weigh 0.081 oz each. 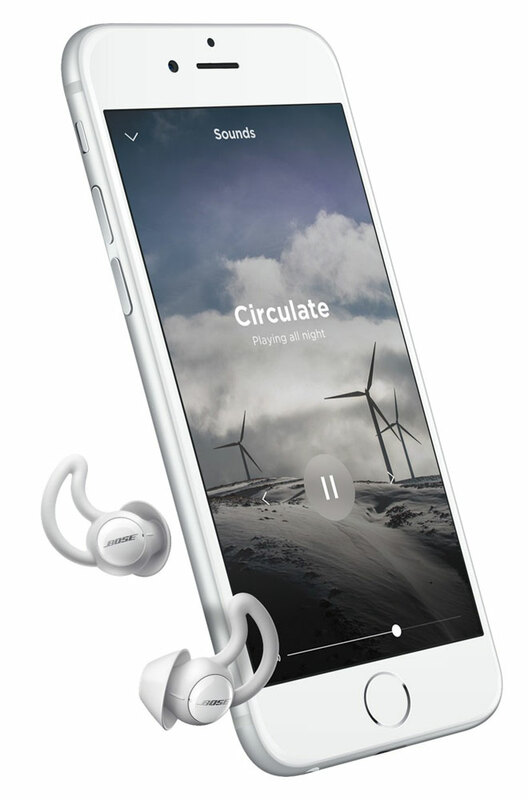 To ensure they fit your ears, Bose includes S/M/L StayHear+ Sleep tips; pliable fins conform to the upper ridge of your ear to keep the sleepbuds in place all night. Bose even has a video to help you get the best fit. The battery in the sleepbuds last about 16 hours between charges, more than enough time for a good night’s sleep. They come with a charging case that recharges the sleepbuds as it protects them. The case’s internal battery provides a full charge, so you can keep the sleepbuds charged when you travel. The case measures 1.06″ high x 3.03″ in diameter and weighs 3.93 oz. It comes with a carrying pouch so you can pack the sleepbuds in your bag when you travel. The Bose Noise-Masking Sleepbuds are $249.95. 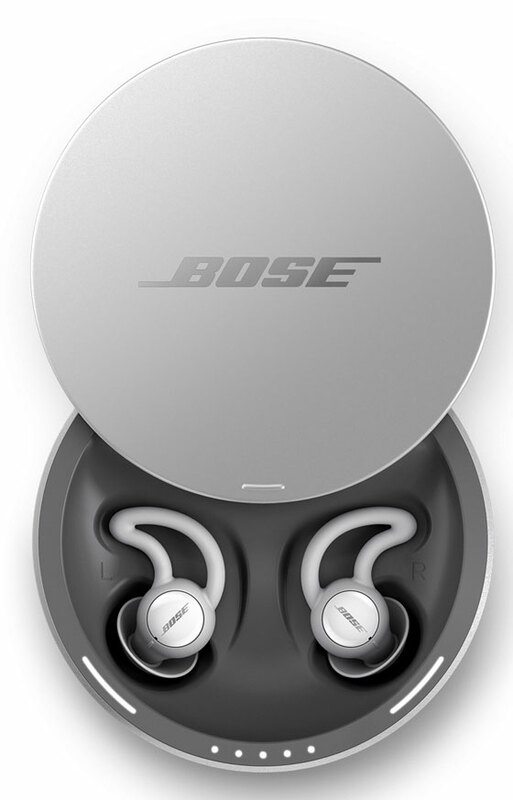 You can purchase them directly from Bose, from Walmart, Amazon, and other retailers. I bought a set of these Sleepbuds when they first came out. They are expensive, but I’ve found them worth every penny. I’m such a light sleeper that any little noise in the house (or out) will wake me up. I’ve tried sleep machines and fans, but they bother my wife. These sleepbuds work perfectly. They fit comfortable so you can lay on your side and the alarm feature is terrific- no more alarms waking the wife. They do have their quirks though. They can be difficult to remove quickly (I have to grab the wings to pull them out). Getting them to charge consistently is a challenge too. You have to set them in the case just right or they won’t charge. Fortunately, there’s a light that indicates good installation. If you travel with them, the battery backup is a nice feature but it’s only good for one charge. I’ve also found they sleepbuds may come off the charging posts if the case is thrown into luggage that gets jostled a lot. Overall, still worth the price to me. Neither foam earplugs nor the Bose earbuds that playback your music do what the Sleepbuds do. Sleepbuds mask ambient noises and they do not play back music. White noise – understood. Just wanted to pass on my expereience with surpressing airplane noise with cheap earplugs that work pretty well. I’m sorry, but why in the heck would you design a product to ONLY stream those sounds? Could they not, for $250, design buds that would also allow music? Good grief. Or buy a Marpac. White noise with no wind.